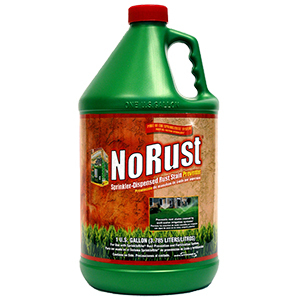 NoRust® automatically prevents sprinkler rust stains from forming. If you have well water and you use your sprinkler system you probably have rust stains on your walls, walks, shrubs, lawn furniture, fences and any other surface in the sprinkler’s path. Use NoRust® in your SprinkleRite® tank to prevent rust stains from forming. It works automatically every time you sprinkle. Use Goof Off Rust Stain Remover to remove stains currently on walls and other surfaces and NoRust® to keep them from coming back. NOTE: Alaska and Hawaii orders ship Standard Overnight or 2-Day Air only. How many gallons of NoRust® do I need to put in my tank? This depends upon your well pump GPH flow rate/HP and the iron content in your well water. If you don't know the PPM iron content in your well water, a water sample kit can be purchased from this website. Most well water contains naturally occurring iron compounds. Lawn sprinklers deposit those compounds on walls, walks, shrubs, lawn furniture, fences and other surfaces, resulting in ugly rust stains. NoRust® neutralizes the iron in well water, preventing rust stains before they start. Can I let the tank filled with NoRust® sit for at least 5 months without using it? It's OK to leave NoRust® in the tank. Make sure to have the cover on tight to keep dirt out and close the metering valve. Is NoRust® safe for plants & grass? Yes. NoRust® is safe for plants and grass when used as directed. Can I use VerdaGro® and NoRust® in the same tank? Yes. VerdaGro® and NoRust® were developed to work together. My vehicle is in the area the sprinkler water hits. Will NoRust® damage the finish off the vehicle? With the great number of different automotive finishes on the market, it's impossible to predict what affect NoRust® will have on any specific vehicle. Vehicles should be kept out of the areas the sprinkler water hits. My NoRust® had crystals in it. Is it still good? Over time, especially with lower temperatures, aspects of the solution can crystallize. Stir the product up before or after adding to the SprinkleRite® tank and the formula will work fine. 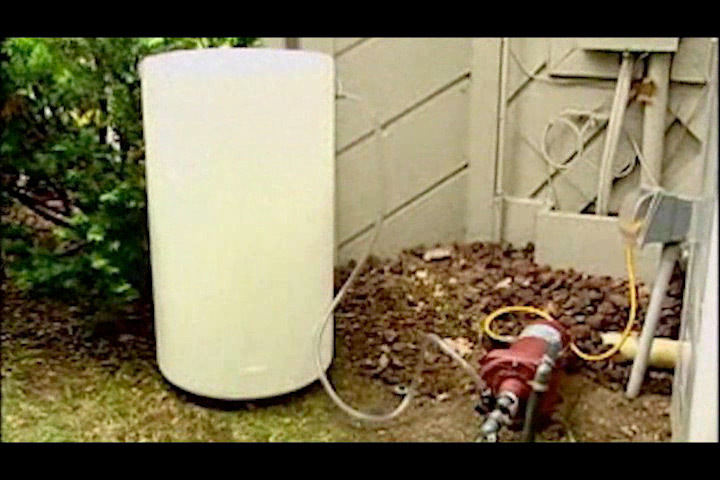 How much NoRust® should I put in my Rid O'Rust tank system? Start with 2-4 gallons and adjust from there. If you're still getting rust stains after a month or so, start adding 5-6 gallons, etc. The “Directions for Use” are included to help you better understand our product. However, they do not provide you with all of the information needed to use the product safely and effectively. Prior to using this product, you should always read the entire label including all cautions. I had a problem with rust stains appearing after I used my sprinkler. A friend suggested that I try NoRust®. Wow, what a difference! The rust stains didn't return after I used my sprinklers. Thank you for such a great product!